Don’t we all just love being at the beach? Chilling underneath the sun and soaking the rays of it, having a good cooling swim in the sea, building sand castles and collecting seashells just to make some lovely necklace. Yes, the feeling is great being at the beach. Yet there’s one question in mind, how does it feel like to be living under the sea? Shall we cue the music please? Let’s face it, ever since when we were a kid and watched the Little Mermaid, we always want to know what it feels like living under the deep blue sea with it’s many fascinating and beautiful sea creatures. Therefore, we don’t have to find a sea witch to grant our wishes. We can easily design our own sea-like-interior. Every little girl/boy who’ve watched the Little Mermaid wants to have that Disney’s under the sea experience. 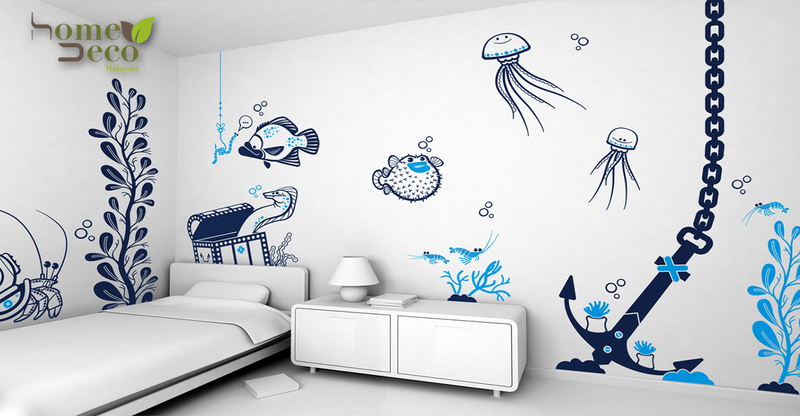 Of course, we can’t just dive-in into the sea to give them what they want, we can always design their bedroom to actually make it look like their swimming in the sea. Don’t feel like “swimming” with one the fishes? Than why not have a walk with them. Wait! What?! That’s right, just a simple walk and sight-seeing at our hallway can make us feel like we’re walking on the sea bed and just casually watching the fishes swim by us. There’s a saying that says we should think big, by so let’s have a big mural painting for our living room just to add-in the effects of being underwater. Mount a big painting can actually change the ambience in our living room. Gazing a painting like this, feels like we’re admiring the colony of Jellyfish swimming up ashore. If we feel like having a big mural painting is a bit too extravagant in the living room perhaps we’ll put it somewhere more personal space. The bedroom is one of the perfect place to immerse ourselves in to the ocean. We’ll be lying on the sea bed and anticipating what’s in the open ocean have in store for us. Perhaps we want to go for something more into a minimalist point of view. A decorative mirror shell is simple enough to make us feel like we’re under the sea and watching our fabulous reflection as if we’re mermaid, merman or even a sea witch. We decide what we like to be in the deep blue sea. Swimming in the open ocean can be a therapeutic feeling as we’re swimming to find out what lies beyond in the open seas and just letting the waves guide us where we’re suppose to be. This feeling make us feel like singing a song from the Little Mermaid. Wished I could be part of your world. 6 Basic Items That Will Make Your House Look Chic and Fab!